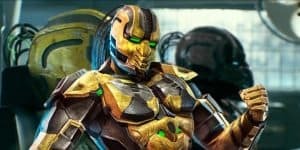 Injustice 2 Gains Mortal Kombat's Cyrax | Nerd Much? According to a picture posted on Twitter by creative director of Injustice 2 Ed Boon, Cyrax from Mortal Kombat will be joining the roster. The picture doesn’t show much, but fans of both games are fairly sure Cyrax is on the docket. Especially since the last character announcement included Sub-Zero, another character from Mortal Kombat, it seems fitting that more from that game will come. The photo in question shows a yellow armored back, of the robotic flavor, with a bright blue glowing tube instead of a spine. If you don’t know Mortal Kombat inside out, Cyrax is one of the cybernetic ninjas within the game series like Sektor and Smoke. One of the colors that Cyrax comes in is yellow, but there has yet to be any official confirmation from NetherRealm studios. The Cyrax photo comes just after the teaser photo of Superman’s Bizzaro skin. Of course, some keen-eyed fans already saw this coming in a previous trailer, but for the rest of us the Bizzaro skin was shown at the SDCC. The Bizzaro skin stood in all its glory with Superman’s paler skin, worn cape, and backwards S. According to the same video, Starfire from the DC comic book universe will also be joining the roster of Injustice 2. With two brand new characters on the way, it seems like the content for Injustice 2 is not showing any signs of stopping. It is one of the best fighter games, in opinion, with a narrative that makes sense and is intriguing, all at the same time. Not the sloppily put together fantasy of Mortal Kombat – though it speaks to the imagination of any young boy from the 80s or 90s, I don’t believe it holds up very well as an adult. Save perhaps by the virtue of nostalgia. Nonetheless, Cyrax isn’t quite confirmed yet, that picture could still be referring to another character. Hopefully we’ll get a new trailer soon enough, revealing the identity once and for all. Injustice 2 is available now on PS4 and Xbox One.